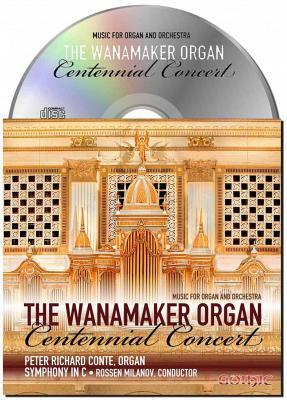 This Gothic CD includes the full 2011 Centennial Concert of the Wanamaker Organ featuring Peter Richard Conte with Rossen Milanov and New Jersey's Symphony in C Orchestra! Writes reviewer Rollin Smith: "Now you can have in your living room what Alexander Russell described when he heard the Widor Symphonie: A Perfect Niagara of Sound.. There is no one in the world as adept at displaying the Wanamaker Organ as Peter Richard Conte, and it shows on this CD. The whole is a thrilling and artisic experience. The orchestra is top-notch, impeccable in its ensemble playing, and gorgeous in its shading. This is one CD not to miss: the combination of organ, organist and orchestra would be hard to beat." Order yours now!